I haven't been able to craft like I want to in the past couple of months, hence why I haven't been posting much. Nothing made = nothing to write about! Between launching my Etsy shop, completing several freelance projects, planning the wedding, etc. time has not been on my side to craft. 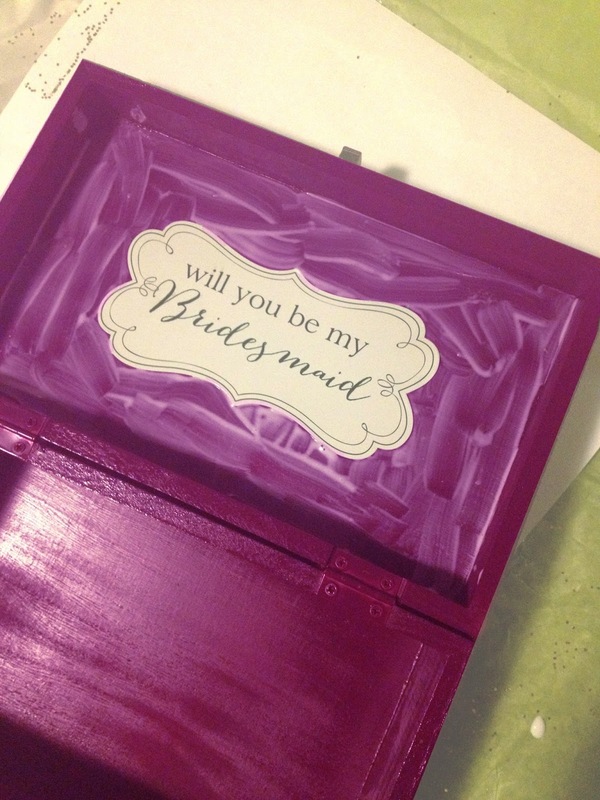 There are a lot of DIY projects that need done for the wedding, however they all involve spray painting or wood staining, and winter on the East Coast has not been kind. I'm hoping this month is warm so I can get some stuff done! This project began before the winter hit, so I was able to use spray paint! 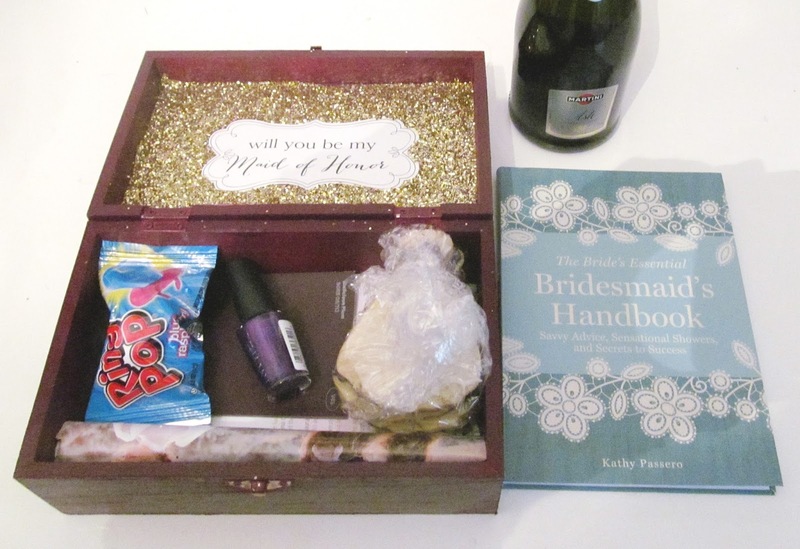 When we got engaged, our friends basically all knew we'd ask them to participate in our wedding. 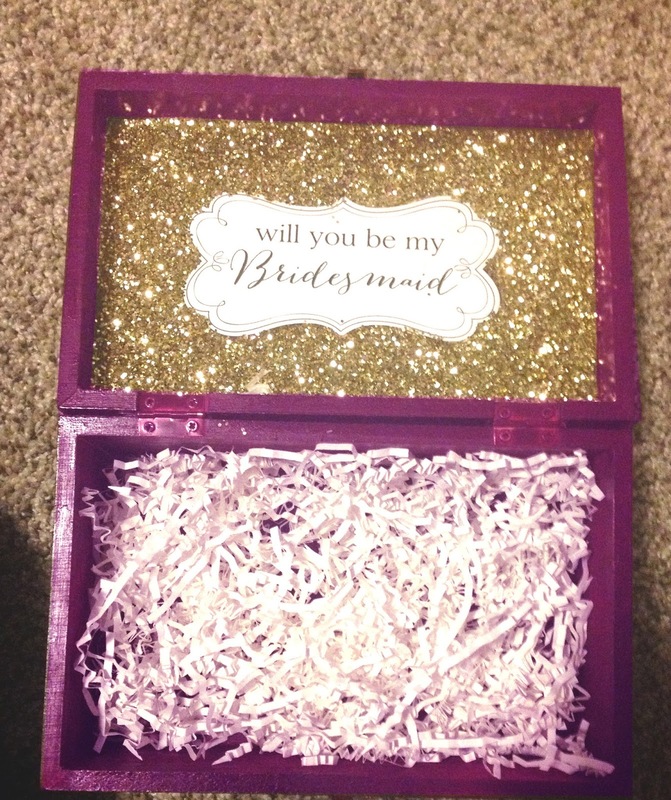 But of course I still had to do something adorable and crafty to officially ask them. 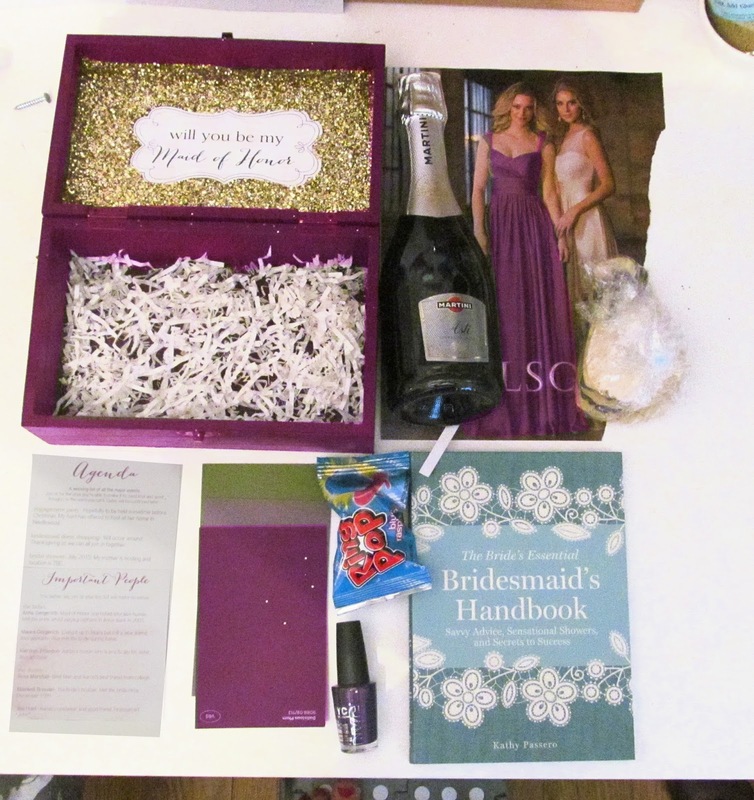 This is how I built my "Will you be my bridesmaid?" boxes and you can do it too! 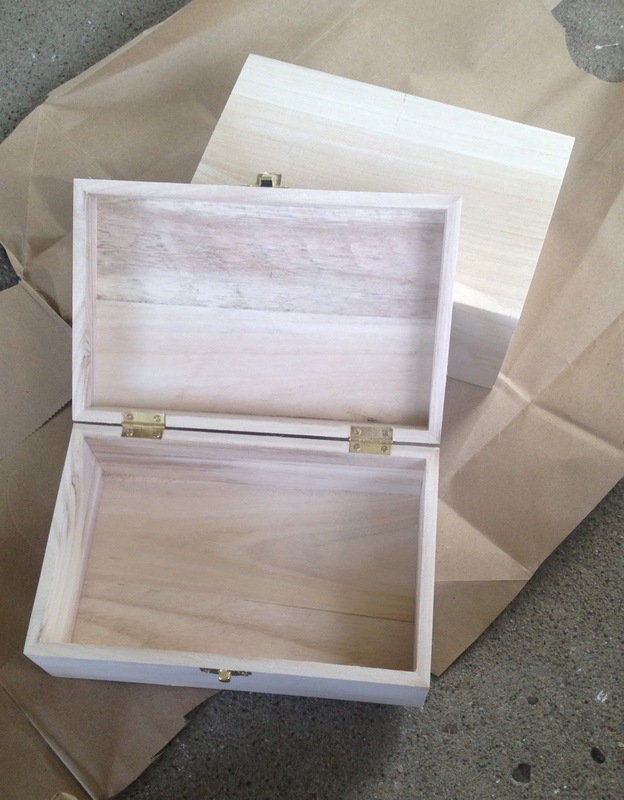 A Box. I got mine a Michaels, but most places with craft stuff have them. Or if you need a bigger box, try a shoe box! Spray paint. 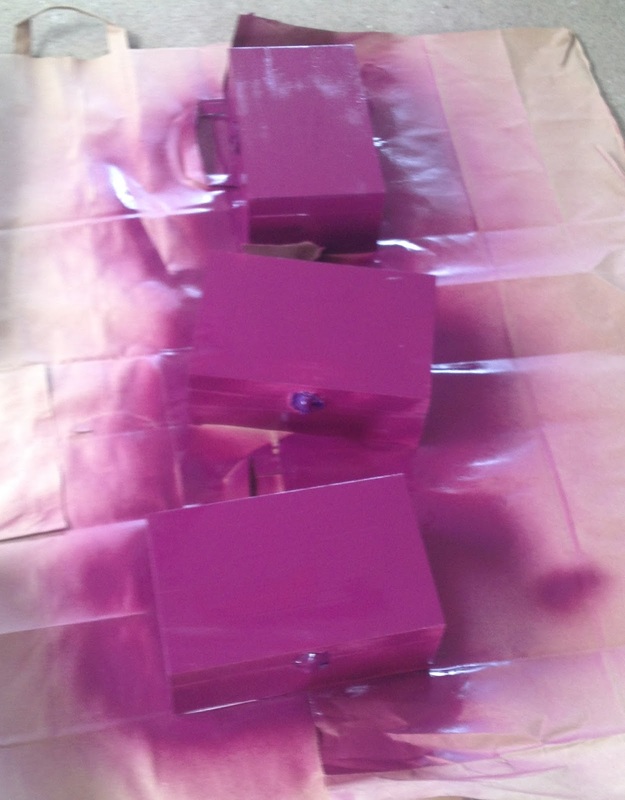 The color I used was "Satin Aubergine" by Rustoleum. Tape to cover any metal pieces of your box. I used painters tape. Stickers to print on. Again, mine came from Michaels. Modpodge and a brush to paint it on with. Tape over any metal pieces of your boxes. Mine only had the clasp in the front, but I've seen boxes that have little metal feet as well. 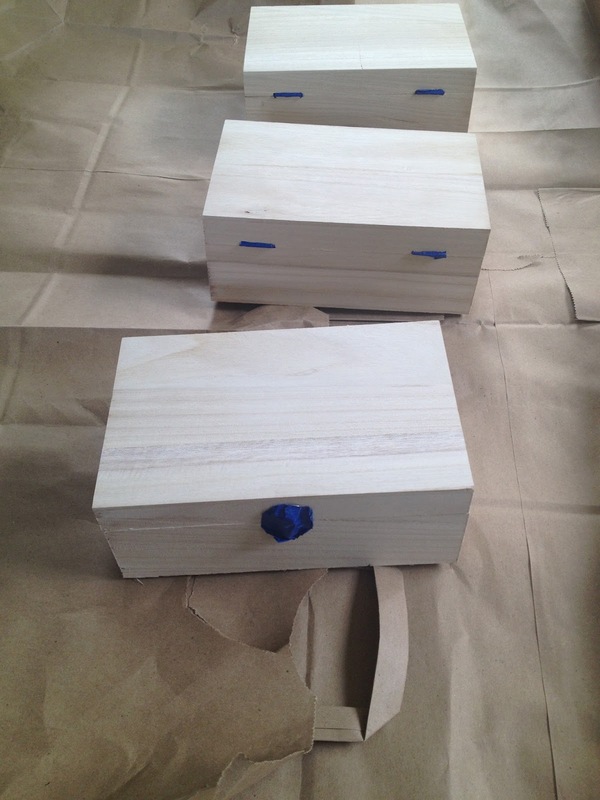 Spray paint your boxes (as many coats as needed) and let them dry for at least 24 hours. I chose to spray both the inside and outside of mine. Make sure they're totally dry because you won't want them to be sticky for the next steps. Print on your stickers and stick them on the inside lid of the box. Mine were fairly simple to print on, but every printer is different. I recommend printing a test page to see how everything will line up before using your sticker page. Using your brush, Modpodge around the sticker, staying as close to the edge of the sticker as possible. 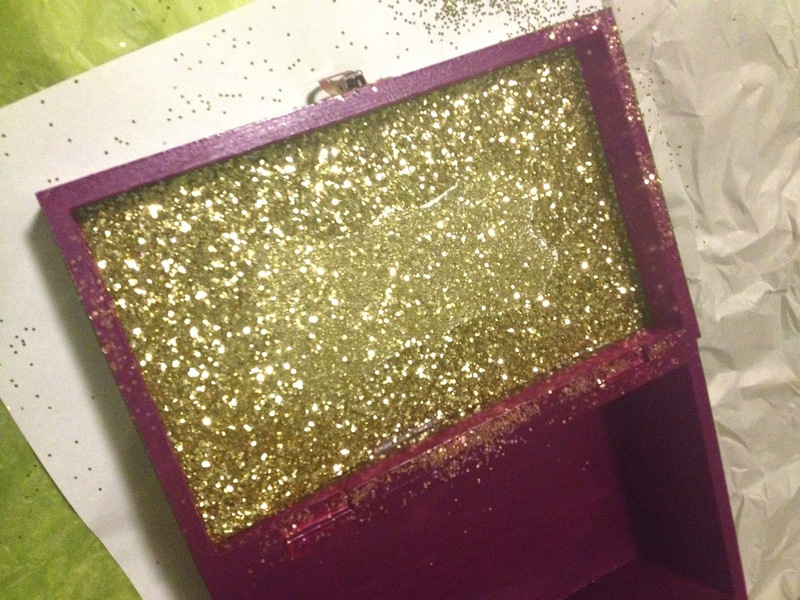 Glitter over the entire inside of your box! Let it dry a little and then dump it over and shake to remove the excess glitter. Obviously, don't shake it over any surface you don't want to be glittered forever. I always shake off glitter over a large piece of paper so I can dump it back into the container and not waste any, but if you don't care about wasting glitter a garbage can works fine too. Let it dry completely and fill! For my fillings I chose some silly things to bring out my wedding themes and colors, but I also threw in a few nice things to celebrate with as well. Obviously all of these are not mandatory. 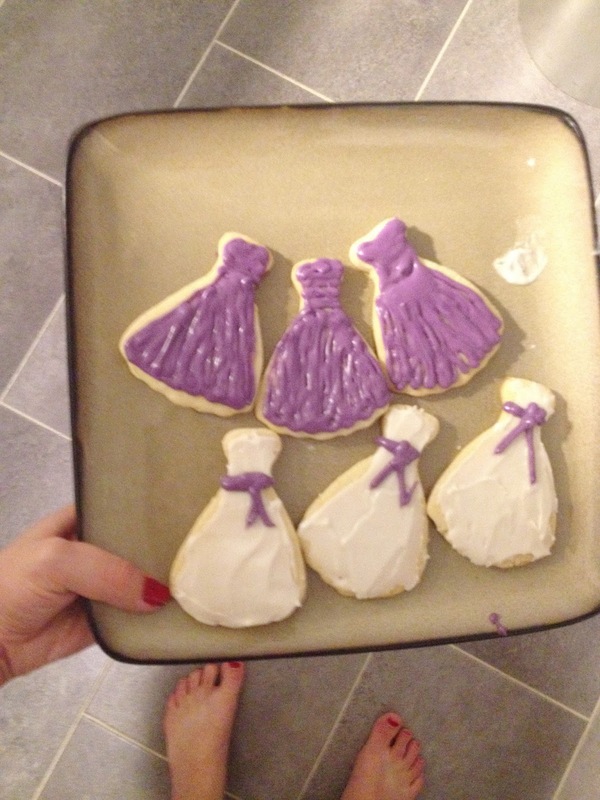 If you're on a budget or have a lot of bridesmaids, the paint chips, the print out, and the cookies were all free. 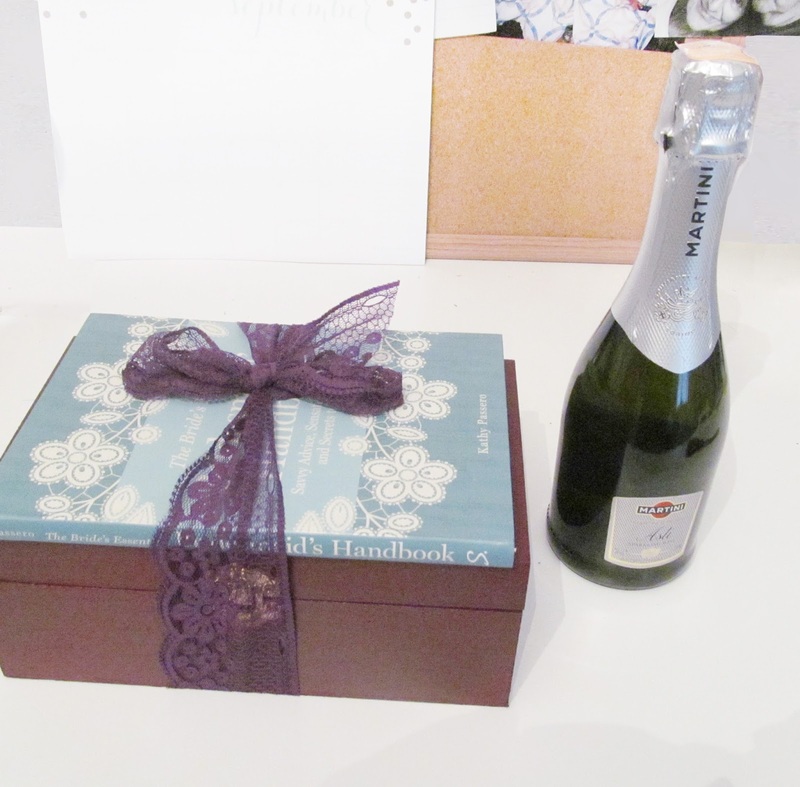 The book and the champagne were a little pricey, but I didn't mind including those since I only have 3 bridesmaids. Other baked goods, macarons, brownies, etc. 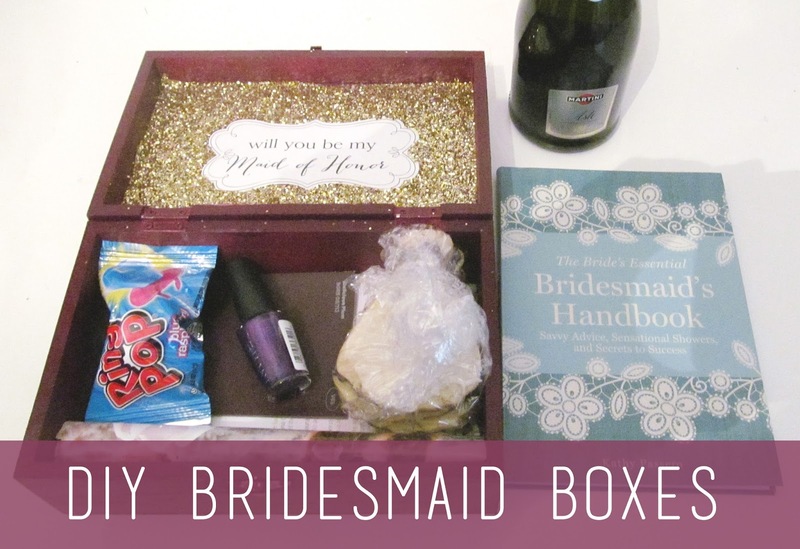 I would have loved to have included some of these but the boxes were kinda small and I had a budget. P.S. They all said yes! 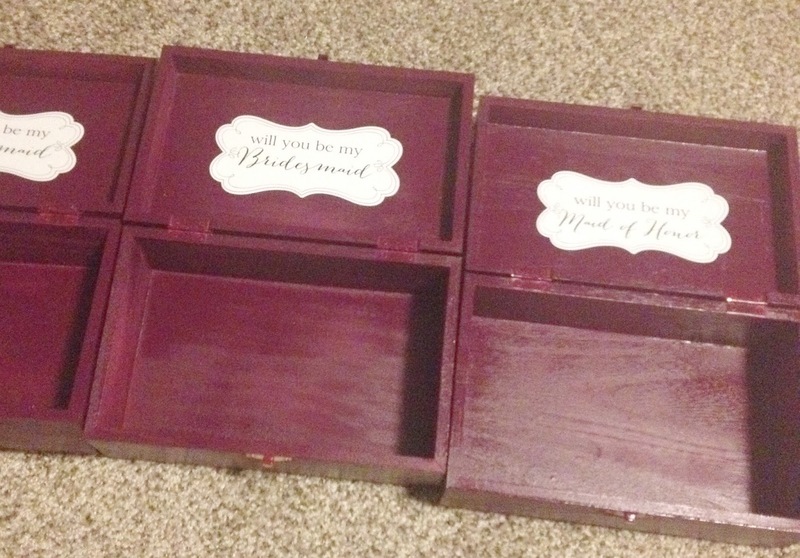 Next week Aaron is going to write a post about his groomsmen boxes and how he made them!